It’s almost here. The most anticipated first round matchup between the Pittsburgh Penguins and Philadelphia Flyers will drop the puck on Wednesday night at 7:30. Hockey fans have been waiting for this since April 1st when Penguins forward Joe Vitale crushed Danny Briere of the Flyers leading to a brawl on the ice and a shouting match between the coaches. It’s no secret that these two cross state teams really do not like each other, and the fact that they are two of the best teams in the league this year is going to make the series that much better. Here are my five keys if the Flyers are going to take down the Penguins. when Bryzgalov is struggling to stop pucks, it usually takes a full team effort at the offensive end to stay in the game. Bryzgalov will need to take the success he had in the month of March and carry it over into April if the Flyers are going to have any chance at stopping the number one offense in the NHL. Yes, Sergei Bobrovsky has been very good in his career against the Penguins, but Bryzgalov was brought to Philadelphia to win games in the playoffs.The recent play of Bryzgalov has largely boosted the confidence of not only the fans, but the guys around him too. If Bryzgalov can maintain a high level of confidence and stay focused on shutting down Pittsburgh, I see no reason why he can’t play like the guy who was named the NHL’s player of the month for March. roles for this team as well. Zac Rinaldo will have to pick his fights, Matt Read will need to score goals and contribute on the penalty kill, Sean Couturier is going to be crucial in shutting down Evgeni Malkin and Sidney Crosby, Brayden Schenn is going to need to contribute points and strong play at the offensive end, Eric Wellwood will need to use his speed to tire out the Penguins defense and generate breakaway opportunities, and Marc-Andre Bourdon will need to be consistent on the blue line and not make any critical mistakes. These six were great in the regular season, but this will be the real test for them. There is going to be a huge amount of pressure on each of them to perform on the national stage. Fortunately for them this team is full of playoff tested veterans who will be able to keep them all down to Earth and playing at a high level. Year in and year out the Flyers are among the league’s leaders in penalty minutes. This year was no different as the team led the NHL with 1318 minutes spent in the penalty box. If they want to have a chance at beating the Penguins, they cannot give their powerplay multiple chances per game. You can be sure to see Crosby, Malkin, James Neal, or Jordan Staal on the ice at all times during a Penguins powerplay. The Flyers penalty kill has been good, but not great this year. They cannot afford to tire out guys like Max Talbot, Sean Couturier, Claude Giroux, and Matt Read by constantly sending them out on the ice shorthanded. That means that when guys like Zac Rinaldo, Scott Hartnell, and Wayne Simmonds head to the penalty box, they need to try to bring somebody there with them. They need to keep bumping guys like Malking and Crosby after plays are over, those two have shown repeatedly that they are not afraid to take a penalty for retaliation. The less time those two spend on the ice, the better chance the Flyers have of taking the series. another concussion.That makes the play of the rookies on this team even more important as Couturier, Read, and Wellwood are all going to be seeing a good amount of time on the penalty kill. These guys are going to need to be fearless out there diving in front of shots and keeping the puck away from Ilya Bryzgalov. That makes the acquisition of Nicklas Grossmann even more important as he is going to play a big part in blocking those shots and clearing the crease, the type of presence this team had been missing since Chris Pronger went down back in November. When the Flyers went to the finals two years ago, guys like Blair Betts, Ian Laperriere (when healthy) and Darroll Powe played huge roles in getting the team through the playoffs. Throughout the season the work of the third and fourth line guys who specialize on the penalty kill largely goes unnoticed because they’re typically not scoring points, this is their chance to shine. Right now the defensive pairings for game one look like Braydon Coburn and Nicklas Grossmann, Kimmo Timonen and Matt Carle, and Marc-Andre Bourdon with Andreas Lilja with Pavel Kubina being the healthy scratch. Coburn and Grossmann figure to get the majority of the time matching up with Malkin and Crosby, something they have excelled at since being paired together. Those two and Timonen are the the Flyers top three defensemen and this team cannot afford to lose any of them for an extended period of time. Guys like Kubina and Erik Gustaffson will be able to fill in for the other three, but they cannot match the abilities of Coburn Grossmann and Timonen. With the absence of Chris Pronger, Timonen has stepped up and played at an all star level all season long. Timonen has been a warrior since coming to the Flyers playing through numerous injuries and putting his body on the line to stop pucks. Coburn has also been consistent during his Flyers tenure but has stepped his game up to another level since being paired with Grossmann. 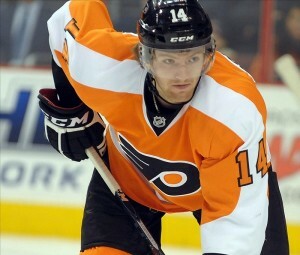 Those two have been the Flyers shutdown line playing a lot with forwards Sean Couturier, Max Talbot, and Zac Rinaldo. In my opinion, it’s no coincidence that Ilya Bryzgalov’s play has stepped up to another level since the acquisition of Grossmann. The Flyers lacked a guy who could clear the crease, and they have that now in Grossmann. These guys have to stay healthy for this team to beat the Penguins. This is sure to be a great series filled with big hits and plenty of offense. My head is telling me one thing, and my gut is telling me another. I’m going with my gut. Flyers in five.